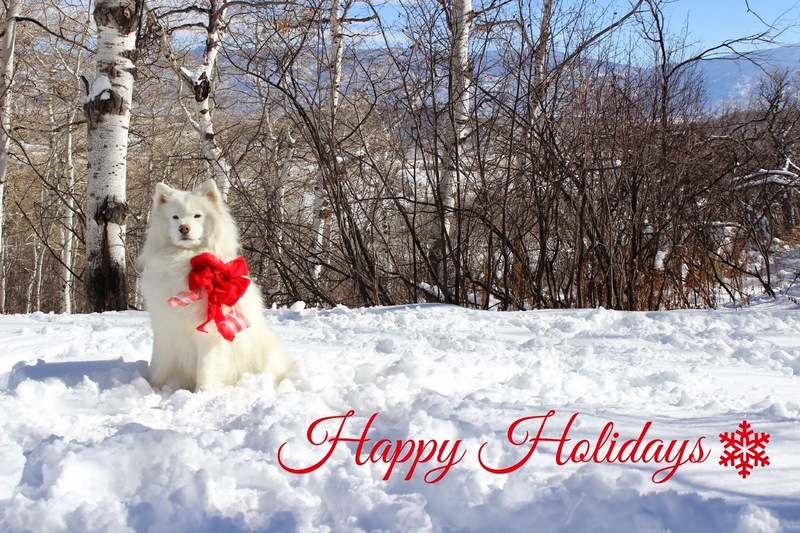 Now that the holidays have come and gone I thought it might be fun to show you the holiday cards I sent out this year and the ridiculous ‘behind the scenes’ pictures that are inevitable when you are trying to photograph your dog! If you’ve been following Chickadee Says for a while (or even just looked at my header!) you probably know I am obsessed with my Samoyed Tinkerbelle. She’s a 50 pound rascal that looks beyond adorable in the snow so I just knew that she was going to be my card this year! So a photoshoot up at my mom’s place in the mountains ensued. Little did I know that it wasn’t going to be a snap, snap finished deal- silly little pup was incredibly hyper and didn’t want to sit still. The following pictures were the result! This was the inside flap of the card! Tink refuses to sit still! She is obviously loving the snow! And SURPRISE: just because Christmas is over doesn’t mean you can’t start preparing for the holiday season in 2014 (woah, that’s the first time I’ve written 2014 so far!). I am such a huge sale shopper, and the darlings over at the King of Christmas are having a huge sale on the Christmas stock! We are talking artificial Christmas trees in normal and GIANT sizes, and lots of Pre-Lit Christmas trees as well! I know I want to snag a wreath! 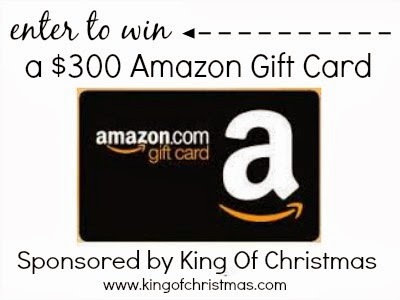 And as an added bonus the King of Christmas has supplied a $300 Amazon giftcard for a giveaway prize! Talk about post-holiday sale shopping! Be sure to enter in the Rafflecopter below!